Dozens of consumers report they received text messages or emails offering easy money if they wrapped their car with advertising. The problem is, the offer is a scam. 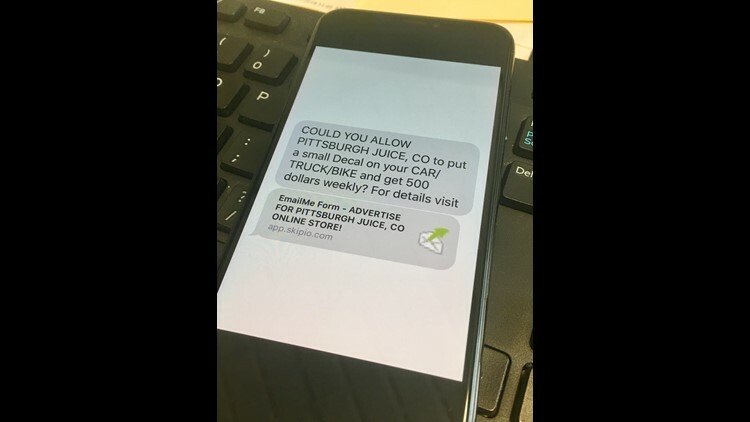 PORTLAND, Ore. — Dozens of consumers report they received text messages or emails offering easy money if they wrapped their car with advertising. The problem is, the offer is a scam. Collinson said the text message promised $500 a week if he put advertising for a juice company on his car. Collinson recalled a family member had once been paid to wrap his car with ads, so he responded to the message. A few days later, a check for $1,950.55 unexpectedly arrived on Collinson’s doorstep. Collinson noticed the name and address on the check didn’t match the sender on envelope. “At that point, I started getting suspicious,” said Collinson. Collinson confirmed the offer was indeed a scam when he called the juice company whose ads were supposedly going to appear on his car. Homison has no idea why crooks are using her company’s name. For the past month, she’s been getting phone calls about the car wrap scam from consumers around the country. Recently, the criminals started using the juice company’s name in a similar work-from-home scam. Luckily, Collinson didn’t deposit the fake check. He didn’t lose any money. Consumer advocates warn fake checks are commonly used by con artists in employment-related schemes, like work-from-home or the car wrap scam. Here’s how it works. The bad guys send you a check. They tell you to go to your bank and deposit the money. You can keep part of the money, but the rest should be wired to another company that will wrap your car. Days or weeks after you wire the money, you find out the check was a fake when the bank tells you it bounced. You’re on the hook for giving the bank a bad check. Meanwhile, the bad guys are long gone with the money you wired. There is no company that will wrap your car. Bottom line: If you get a message urging you to deposit a check and wire money back, it is a scam. The BBB said it has received a handful of complaints about the car wrap scam in the past few months. It’s not clear who is behind the scam or where they’re located, although postal markings suggest Collinson’s fake check and envelope was sent from a zip code in south Florida.